I have always loved the mountains. When it came time to plan our vacation this summer, Jineen (my good friend and Windchase's indispensable manager/trainer) and I wanted to go somewhere we had not been before, and the Canadian Rockies seemed the perfect destination. 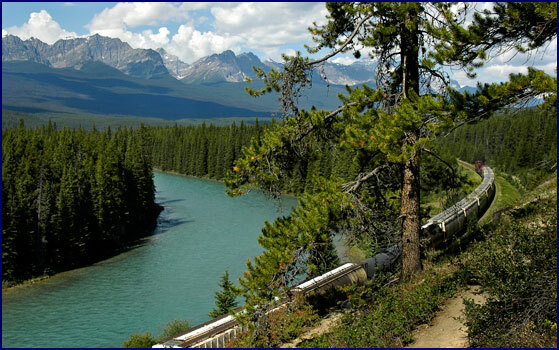 We made plans to sightsee and hike in Banff and Jasper National Parks, which span the continental divide along the border between Alberta and British Columbia, and to ride horses in the Willmore Wilderness Area. Come share in our travels. We traveled on July 27 (my birthday! ), changing planes in Chicago and arriving in Calgary around nine that evening. Right away we were off to a good start; in the airport near baggage claim was one of the most beautiful statues I have ever seen. It was five bronze horses, larger than life, leaping and plunging together in a curved line; they seemed to bound right out of the wild and into one's imagination. 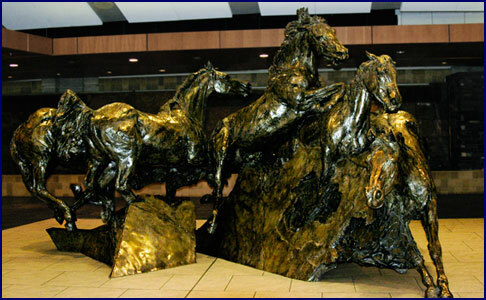 It was an amazing piece of artwork, entitled 'Breakaway,' by Robert Keith Spaith. 'Breakaway,' by Robert Keith Spaith. We picked up our rental car from Enterprise; the guy working there gave us a choice of two vehicles. Based on experiences from past trips, Jineen asked him which one had higher ground clearance; he looked at us suspiciously and asked, "Where are you planning to take it?" We assured him we wouldn't dream of driving off the pavement, and then chose the Toyota, with the higher clearance. Driving across town from the airport, we could see that Calgary is very open and expansive. The term Big Sky Country came to mind, though that moniker is usually associated with Montana across the border. The atmosphere in Calgary was friendly, and very western, and we felt some regret that we hadn't been there earlier in the summer for their world famous rodeo, the Calgary Stampede. Knowing we would be traveling in National Parks and wilderness areas where shopping is difficult, we visited a liquor store to stock up. We bought enough wine for our Happy Hours for the whole trip, including three bottle of Stoneleigh chardonnay from New Zealand, one of our favorite wines. Then it was off to our motel for a good night's sleep. We were up and on the road early, eager to get to the mountains. We stopped at Safeway to stock up on Happy Hour supplies, and we also put in a good supply of trail mix and granola bars, figuring this would tide us over in case the food on the riding trip was really bad. There was one tense moment when Jineen got her hand stuck in the banana chips dispenser, but otherwise we got out of Safeway unscathed. Driving west from Calgary, we crossed wide expanses of rolling pasture and open sky. After about an hour we topped a rise, where suddenly before us the rolling hills gave way to mountains in the distance, crowned in white. We left the farmland behind us when we passed Canmore, entering a land of rugged peaks, pine and aspen trees, and mountain meadows. The scenery was immediately spectacular as we entered Banff National Park. We bypassed the town of Banff, not being much interested in tourist traps, but took the Bow River Parkway, a small winding road that is a less traveled alternative to the busy Route 1. Driving slowly, we scouted for wildlife and enjoyed the scenery. There was a lot to see on the Parkway, and we took our time, pulling over whenever we passed a particularly scenic or interesting spot. Our first stop was the Mule Shoe Wetlands, a marshy pond next to a river, surrounded by aspen trees. Here we had our first wildlife sighting for the trip - a Columbian ground squirrel, sitting up by its burrow like a prairie dog. Further on we stopped near Castle Mountain, where the Castle Cliffs towered over us in resplendent grandeur. We had our second wildlife experience when we got out of the car and were immediately swarmed by a cloud of mosquitoes. We traveled along the Panorama Ridge, and stopped to look down over the Bow River. Spectacular mountains formed the backdrop for this blue-green river, and a railroad track ran along the near shore. An osprey flew above the water, diving for fish, and then stopped to perch in the tall trees by the riverbank. A long freight train passed by, rounding the turn known as Morant's Curve before disappearing into the distance. Lake Louise is widely considered to be one of the most beautiful lakes in the world, and a must-see destination. We expected it to be crowded, but we were not prepared for the mobs of people in the packed parking lot - we couldn't cope. Quickly changing plans, we left Lake Louise and drove down to Lake Moraine instead. It was busy there as well, but we were able to find a place to park, straddling a ditch behind a camper. We walked along the shore of the vibrant turquoise lake, overlooked by tall mountains with cornices of snow. 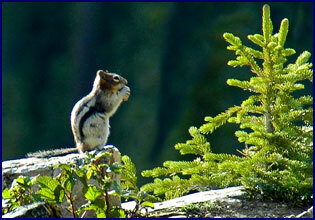 Before the trip, I had purchased a book entitled, Don't Waste Your Time in the Canadian Rockies; The Opinionated Guide. It rated most of the hikes in the parks on a scale of Premier, Outstanding, Worthwhile, or Don't Bother. This book turned out to be an extremely useful guide, and we chose our hikes on the basis of which were given the highest 'four boot-print' rating of Premier. We decided to do the 7.1 mile hike to Lake Annette, which was rated as Premier. 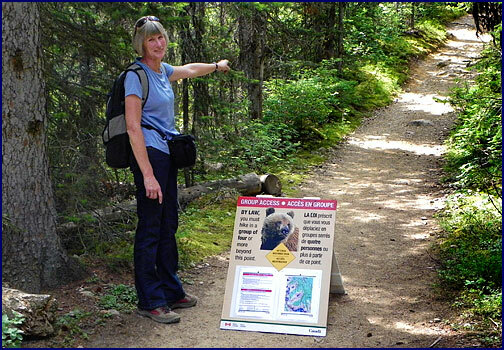 Following the advice in the book, we phoned the Park Rangers office to see if there were currently any bear restrictions on the trail; they told us there were not. We parked at the trailhead, then followed the path uphill through the woods, alongside a rushing creek. The trail climbed steadily, after a while coming out on a ledge high above the stream, where we could catch glimpses of the snowy peaks through breaks in the trees. The path was fairly level, and we followed it through dense woods for quite a long way, glancing over our shoulders often to check for bears. Eventually we came out into an open glade, crossing the stream three times over wooden bridges, stopping to admire the beautiful views down the valley. Ahead of us towered a tall peak, with a cornice of snow on the top gleaming white in the sunlight. 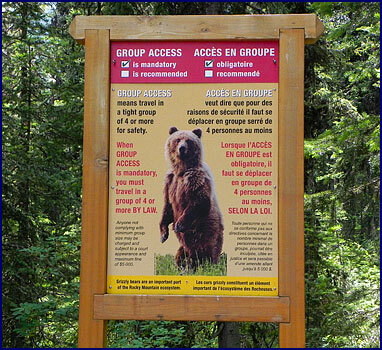 We passed some lone hikers and several pairs of two, so clearly we were not the only ones ignoring the Bear Restrictions. We kept a wary eye out for bruins, but the only wildlife we encountered was a little field mouse crouching by the side of the trail, which on closer examination seemed to be blind. Jineen insisted on petting him; I thought he looked a bit diseased. We entered the woods again, and the path climbed steeply for the last half mile. As we labored up the incline, ominous black clouds rolled in above us, accompanied by loud rumbles of thunder. We topped the rise at last and came out of the trees to see Lake Annette before us, a rich blue/green in color, hemmed in close by rugged mountain peaks. Across the lake, the snowbank we had seen earlier from a distance now loomed above us, at least fifty feet deep; a narrow snowmelt stream ran from it, tumbling down across the barren slope. The thunder was louder now, nearer. The two guys we had planned to use as our bear protection alibi were just leaving the lake as we arrived; they wished us safe passage and headed out fast, as though they could outpace the weather. We were alone with the oncoming storm. A sharp crack of thunder reverberated down the valley, echoing back and forth between the peaks. The rising wind brought a quick ten degree temperature drop, and it started spitting rain and hail. We were sure we were in for a dousing. But no sooner had we scrambled into our raingear than the brief shower ended, as the storm passed and the sun came out again. We were barely damp. And that turned out to be the most we got rained on for the entire trip! We walked along the side of the lake, watching the last errant raindrops making ripples in the now still surface. The clear blue water looked inviting, but sticking a hand in the ice cold glacier-fed lake quickly disabused me of any temptation to swim. At the far end of the lake we climbed over the rocks for a while, then sat on a boulder and ate trail mix and dried apricots, enjoying the solitude. Looking up at the steep cliffside above us, we spotted a mountain goat on a narrow ledge, silhouetted white against the granite background. Presently we headed back, retracing our steps. We did not see a soul on our return trip, either human or ursine. The only wildlife we encountered were a few birds and one toad. Our legs became more and more tired as we went on; mercifully it was mostly downhill, but every slight incline made us groan. We were glad we had chosen a hike with a modest elevation gain to acclimate ourselves on the first day; by the time we reached the car park, our legs were like jelly. Tired but happy, we climbed in the car and celebrated the day with a glass of the Stoneleigh chardonnay. We continued north on the Icefields Parkway, stopping at each viewpoint to admire the incredible scenery. The road was lined with red Indian Paintbrush and little white puffball flowers that seemed to glow in the slanting evening light. 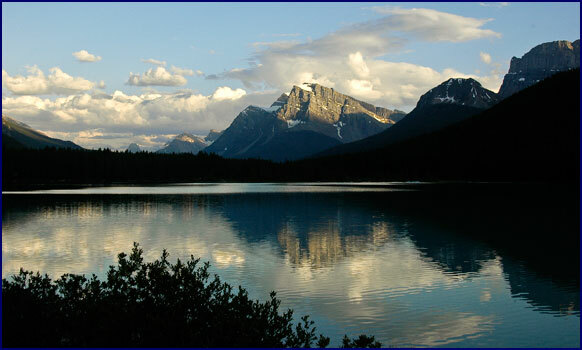 Crowfoot Glacier, named for its distinctive shape, hung poised above Hector Lake. Bow Lake was especially impressive; it was a deep blue-green color, framed by mountains and glaciers. The sun, dropping behind the peaks, sent out dazzling shafts of sunlight. We walked along the edge of the lake, but our legs were increasingly tired, so we didn't go far. It was 8:30 by the time we came to Peyto Lake. There was a large parking lot, no doubt usually crowded, and a paved trail leading steeply uphill to the overlook. Our tired legs protested at the thought of climbing, so since there was almost no one around at this late hour, we drove up to the handicapped parking lot - from there it was just a short paved path to the overlook. It didn't make us feel guilty, as we really were feeling rather handicapped . 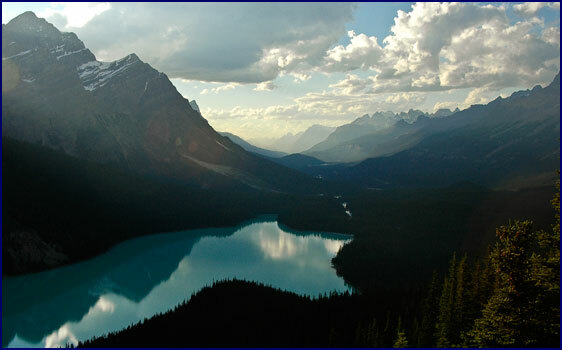 . .
Peyto Lake lay far below us, absolutely stunning, the water an outrageous turquoise color. The Peyto Glacier dominated the mountainside on our left. A chalky white river ran through the scree field at the base of the glacier, winding down the valley in many channels before emptying into the cyan lake. Looking to the right, we could see layered mountains, topped with white, fading off into the distance in the haze of the setting sun. It was a quiet, peaceful evening. Everyone else had left the overlook; our only company was a gold mantled ground squirrel (similar a chipmunk) eating a nut. We watched him for a while before heading on. Jineen and I have a tradition on our trips, where in the evening we find the most beautiful secluded spot we can and stop there for 'Happy Hour.' We parked beside Waterfowl Lake and dined on cheese and chutney on crackers, with cookies for dessert, accompanied by the NZ Stoneleigh chardonnay. The mountains and bright clouds were reflected in the calm surface of the lake in the dusky evening light. It was nearly ten o'clock by the time we came to the Saskatchewan River, and not yet quite fully dark. We crossed the wide braided river and found our lodging for the night, an inn called The Crossing. We went wearily to our beds and slept like logs.